For the last month I have been attempting to Tweet links to the Imperial War Museum's website, the Lives of the First World War along with appropriate photos of the men or of memorials where they are Remembered, for each of the 221 Barnsley men who lost their lives in the Battles of Third Ypres. I am hoping to Tweet most of the names on the 100th anniversary of the day the individual man fell. Although the whole campaign is now often called Passchendaele that name actually specifically refers to two battles towards the end of the period covered. For more information I suggest you go to the Long, Long Trail website's very comprehensive page on the Battles. I have created a Community on Lives to gather together all these men's stories. As a past volunteer for the Barnsley War Memorials Project I have access to their constantly updated master spreadsheet, which will be the basis for the forthcoming WW1 Roll of Honour. This provided me with the names, regiments and service numbers of the 221 men who fell or were assumed to have fallen between 31 July 1917 and 10 November 1917. The Barnsley War Memorials Project are also very fortunate to have been given privileged access to the Barnsley Chronicle from August 1914 to the end of 1918 as part of their mini-project to index all mentions of soldiers in the newspapers. This project has now been completed thanks to the efforts of over a dozen volunteers from all over South Yorkshire. The resulting index is available at Barnsley Archives, in both paper format and as a series of searchable spreadsheets. Permission was also given for photos of the men from the Barnsley Chronicle and the other local newspapers with Barnsley coverage to be used in the Roll of Honour project and on Lives of the First World War. Transcripts of some obituaries and death notices can also be found on Lives, but if you want the images of those for your ancestors you will need to visit Barnsley Archives yourself (please do, they need our support to keep operating the hours they are currently open) and search the index for the reference before printing out your own image from the digital copies of the Barnsley Chronicle. Only 55p an A4 sheet last time I visited, a bargain! The Barnsley Independent and South Yorkshire Times are also available, on microfilm and un-indexed I'm afraid, but if you know the date of death of your WW1 ancestor it is relatively easy to go to the right part of the newspapers to do a search. If you check the Chronicle index first you may get an idea of when news of your ancestor's death reached Barnsley. It could sometimes takes months for the families to be informed that a man was now officially presumed dead, rather than missing. Copies of articles from these newspapers can also be printed out. 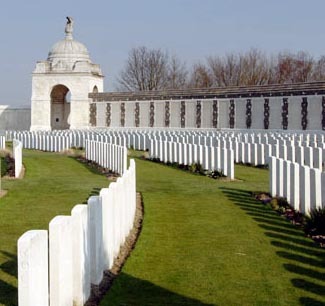 I has shocked to find that out of the 221 Barnsley connected men who fell during the Battles of Third Ypres 46 of them were lost on one day, 9 October 1917. This was the Battle of Poelcapelle. You can find a detailed description on Wikipedia. It was the classic attack through heavy mud, with too little artillery support to create an effective creeping barrage which in any case soon became too fast for the advancing soldiers to keep up with. The majority of Barnsley's soldiers in this Battle were from the 1st/4th, 1st/5th and 6th Battalions of the York and Lancaster Regiment, who were in the 49th (West Riding) Division, II Anzac Corps and the 11th (Northern) Division, XVIII Corps. 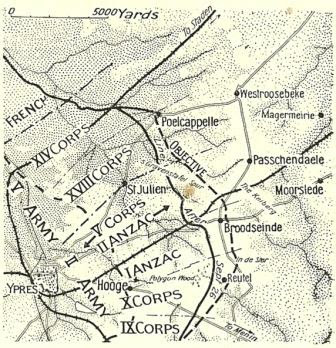 In the map above you can see these two Corps are in the centre of the advance. Ten of the fallen were in the 1st/5th Battalion of the West Yorkshire Regiment who were also in the 49th (West Riding) Division. All but three of the 46 of the Barnsley men lost on 9 October 1917 are remembered on the Tyne Cot Memorial. This means that they have no known grave. Two of the exceptions, who were each buried in cemeteries behind the British lines, are noted as having died of wounds, suggesting they had been injured prior to the 9th and did not take part in this particular battle. The remains of the third man, John Costello, were found after the war, identified by his disc, and reburied in Cement House Cemetery near Langemarck along with a number of unidentified men found nearby. The OH and I visited Tyne Cot in 2009. The long memorial wall sweeps around the top of the site and commemorates nearly 35,000 men who fell in the Ypres salient after 17 August 1917. Men who fell prior to this date are remembered on the Menin Gate. I hope I will at least be able to add some family detail, plus photos and transcriptions from the Barnsley Chronicle where available, to each of these 46 men before the centenary of their deaths in October. However it is unlikely that I will be able to Tweet them all individually on the day as I would have wished, there are just too many. But I will share my list and with the information on that anyone can look up their stories on Lives of the First World War and their commemorative information on the Commonwealth War Graves Commission website. Did your WW1 ancestor serve in any of the Battalions I have mentioned? Why not look them up on Lives of the First World War and add your family stories and photos to the site. It is absolutely free to use to add this kind of thing, the paywall only comes into play if you want to search the records they have made available, and if you have a subscription to Ancestry or Find My Past you probably have access to these already or you could access them for free in Barnsley (Ancestry) and Sheffield (Find My Past) libraries. It is not just men who were killed who are Remembered on Lives, anyone who was affected by the war may already be included. If your soldier, sailor, airman, nurse, munitions worker or civilian casualty or other WW1 ancestor is not yet named on the site you can ask for them to be added by submitting a request to the Support Forum.